I’ve chatted to Room 31‘s lovely owner Ruth a few times recently after they joined in with one of the #fbloggers Twitter chats, which I thought was such a brilliant and clever way for a brand to get to know the blogger community. Room 31 is a gorgeous online shop that sells clothes, shoes and accessories from the likes of Vero Moda (one of my favourite brands), Yumi, Vila and Brat and Suzie. I ordered several things from their sale last week (including this cute Peter Pan dress for 14.99 – bargain!) and shortly afterwards they contacted me to ask me if I wanted to review another item from the website. 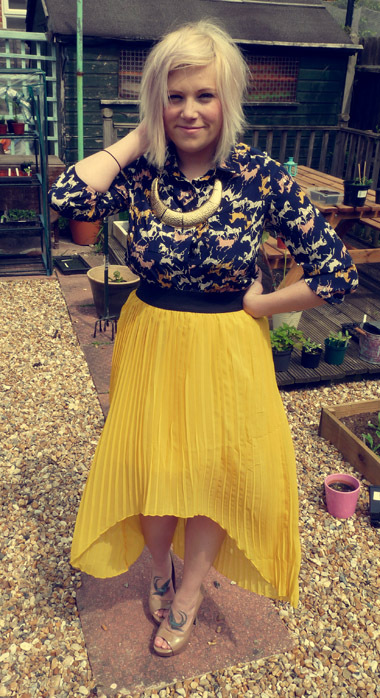 Ruth very kindly sent me this absolutely gorgeous skirt, along with another item which I also can’t wait to show you. I absolutely adore this skirt and I know I’ll be wearing it lots throughout the summer. I love the drama of having a long skirt floating behind you, makes me feel like running through cornfields or along beach promenades…. For now though I’ll just pose in my garden! If you haven’t had a nose around the lovely things on the Room 31 website I highly, highly recommend you have a look – they also have a blog and a Twitter that are well worth a follow.